1st Gear: GM Vice Chairman and Chief Financial Officer Chris Liddell today announced that he will leave the company April 1, 2011 after just over a year with the just-emerged-from-bankruptcy-and-IPO'ed automaker. He'll be succeeded by Dan Ammann, 38, who's currently a GM vice president, finance and treasurer. Before coming to GM, the native of New Zealand worked for Morgan Stanley for 11 years. Sorry, hold on a second... wow, we just realized he's a 30-something becoming the CFO of the world's largest automaker? Jeez, what the hell have I done with my life. 2nd Gear: Could modern cars operating with the help of internal computers be vulnerable to hackers? Could someone tamper with your software-controlled brakes or stop the engine from afar? Not really, or, at least not easily. Why not? Nefarious no-goodniks can already steal your car with a smart key. And don't even get us started on road signs. 3rd Gear: At 1.5 tons, this life-size model of the Chevrolet Orlando weighs just 369lbs less than the real thing. There's no driving this car, though. 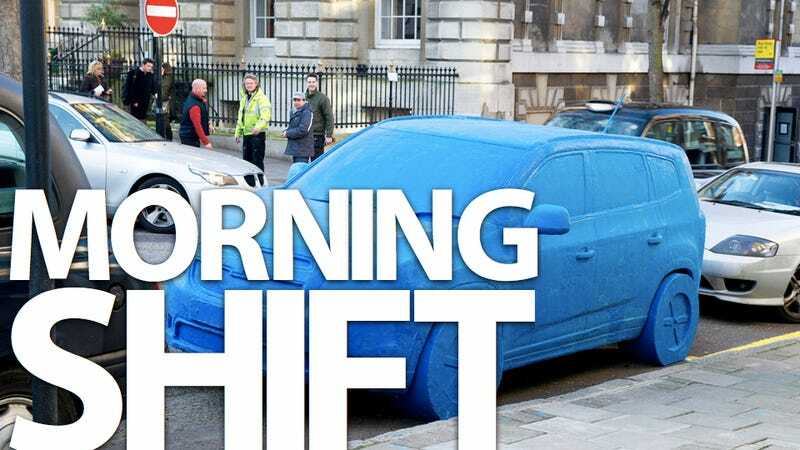 Built over two weeks by a team of eight sculptors, the car is parked on a London street as a publicity stunt. Just don't let any Kindergarten classes walk by. They might try to eat it. Or wait, was that paste? Hmm, I just remember paint chips. 4th Gear: The spike in the price of an oil barrel has been caused by "market pricing and risk premium on the future oil supply," not a lack of supply, Rex Tillerson, CEO and chairman of Exxon Mobil, told CNBC Wednesday. And by "market pricing," I think he means "market speculation." Well, whatever the reason, we're just glad we ran our how to save money on gas special yesterday. 5th Gear: Goodyear CEO Richard Kramer saw his compensation rise 69% to $8.5 million in 2010, up from $5 million in 2009. That's especially surprising considering the Akron, Ohio-based tiremaker lost $216 million in 2010 and closed a plant in Tennessee that employed nearly 2,000 workers. Guess reality is not always where the rubber meets the road. 6th Gear: Volkswagen's expected to confirm a full assault on the World Rally Championship before the end of this month, according to Autocar's sources. The German manufacturer, which has been linked to a WRC campaign since the series confirmed its new 1600cc-based regulations, is being tipped to announce its programme at a party on 22 March that will celebrate its Dakar rally raid success.